GENERAL INFORMATION ABOUT OUR HOME, KEMER. Kemer, which is connected to Antalya through a 42 km of motorway, passing through a fascinating mountain scenery, was the ancient city called Kimeros, and now an attractive resort town. 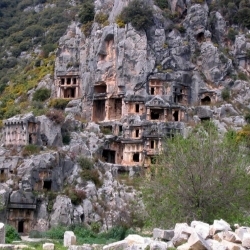 The history of this area, the ancient Lycian Peninsula, can be traced back to the Neolithic Age to the settlements at Beldibi. Kemer is an important tourism center with green and blue met qualified, resort, restaurant and beach facilities, yacht ports and historical cities. One of the leading attractivenesses of Kemer is its natural beauty. Sea, forest and mountains are joining at one point. For example, reaching sea waves till pine trees and usage of pine trees as shady spots at beaches is very attractive. Clearance of the sea, green of forest is another beauty in Kemer. Kemer is a made-to-order resort carved from Turkey’s pristine pine-shaded Mediterranean coast 35km (22 miles) southwest of Antalya. Though not as large or elaborate as Mexico’s Cancún, the principle at Kemer (keh-MEHR, pop. 25,000) is the same: pick a favorable seaside location with little habitation and build a modern resort town of white concrete buildings in it. The beaches are mostly of large pebbles and stones, although the ones near the yacht marina and Yörük Parki (an anthropological park with a Turkish nomad theme) are of sand. Kemer can be a base for exploring nearby sites like Olimpos, Phaselis, Termessos, Perge and Aspendos, but Antalya is more centrally located and, overall, has more to offer. 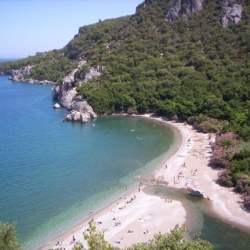 Presence of Phaselis, Olympos like antic regions near to it is another attractiveness. It is possible to reach Phaselis and Olympos from Kemer by maritime lines and road. Recently organized safari tours to Sögüt Cuması, Altinyaka Dere Village like high places can also be mentioned among regional attractiveness. Caverns are also other attractiveness within the region. One of these caverns, Beldibi cavern is 27 km south west of Antalya, and at shore. Ruins of prehistoric ages are found. Another valuble to see cavern is Molla Deliği cavern, and present on eastern slope of Mount Tahtalı, which rises at west of Kemer. You can only reach to this cavern by foot from Aşağı Kuzeydere or Tekirova villages on Kemer – Kumluca highway. You should walk 3.5 – 4 hours from both villages. Climate in Kemer: Summers are hot and dry, and winters are warm and precipitating. In the height of summer temperatures frequently exceed 40°C. It is at 58th km of Antalya – Finike road. It is also possible to reach Phaselis city by maritime lines, which is 15 km away from Kemer. 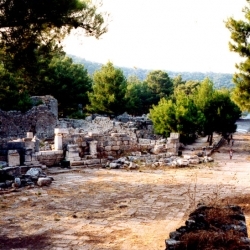 It is thought that one of the eastern coastal cities of Lycia, Phaselis is one of the commercial cities of Hellenistic Age of VIth century B. C. It becomes a bishop center during Romans. Thick walls of eastern port of Phasellis, composed of three ports, are still in good condition. Western port, whose front and western parts are remained under sands is appropriate for having a swim. Most parts of the ruins, which are on ground in Phaselis are remained from Roman period. These ruins are; port, castle walls, Zeus Temple, King Antonius Caravella road, also twenty lined theater ruins. Peninsula’s throat part composing street is marvelous. It begins from south port and reaches to city gates. It is thought that it is also used as a stadium from time to time due to width and shortness of this street. Because history writes that two important athletism competitions are performed within Phaselis. It is between Kemer and Adrasan. After passing Phaselis, a plate on Antalya – Kumluca road, shows Olympos road. Çıralı is an ancient coastal village beside Olympos. The city, which is found on 2nd century B. C. is emptied on 6th century. Famous Bellerophontres – Chimera war is made here. An hour of walking on a tight and uneven slope coming from a river bed after Çıralı will bring you to Chimera’s unique natural ambient. Chimera is known by the natives as “Yanartaş” due to continuously burning natural gas, which is coming from mountain. Ulupınar is a village situated 30 kilometres from the district centre of Kemer, in Turkey‘s Antalya Province. It is on the outskirts of the Olympos Valley National Park, famous for its eternal fire, and commands a region of stunning natural beauty. Particularly noted areas are the dense woods and the source of a river (which gives its name to the region; pınar meaning water source in Turkish) where icy waters spurt out from rocks at an altitude and descends in a waterfall. There are several restaurants situated along the river near the village, which is on the axis of the road from Kemer to Finike and Kumluca, and these serve troutfrom the river as well as more varied dishes. The extension of Ulupınar village toward the seashore constitute the village of Çıralı, notable for its long beach and tourism facilities. Mount Chimaera was a place or places in ancient Lycia, notable for volcanic phenomena and said by some ancient sources to be the origin of the myth of the Chimera. Ctesias is the oldest traceable author to offer this euhemerizing theory. This was the citation given by Pliny the Elder, who in his second book of Historia Naturalis identified the Chimaera with the permanent gas vents in Mount Chimera, in the country of the ancient Lycian city of Phaselis, which he described as being “on fire”, adding that it “…indeed burned with a flame that does not die by day or night”. Pliny was quoted by Photius and Agricola, although the exact location of the mountain described by Strabo is still open to debate. Strabo and Pliny are the only surviving ancient sources who would be expected to discuss a Lycian toponym, but the placename is also attested by Isidore of Seville and Servius, the commentator on the Aeneid. Strabo held the Chimaera to be a ravine on a different mountain in Lycia, placing it unhesitatingly in the vicinity of the Cragus Mountains, the southern part of the present Babadağ, some 75 km due west as the crow flies, and Isidore quotes writers on natural history (see below) that Mount Chimaera was on fire here, had lions and goats there, and was full of snakes over there. Servius goes so far as to arrange these with the lions on the peak of the mountain, pastures full of goats in the middle, and serpents all about the base, thus imitating Homer‘s description of the monster.